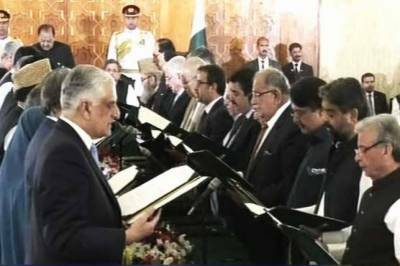 Islamabad (Staff Report): Prime Minister Shahid Khaqan Abbasi's 47-member cabinet took oath by President Mamnoon Hussain during a ceremony at the Presidency in Islamabad on Friday morning. According to details, the new cabinet includes 28 federal ministers and 19 ministers of state. Apart from retaining most members of the previous cabinet, the new cabinet includes six new federal and 12 state ministers.